EasyRead Time Teacher's simple 3-step teaching system really works. Try it yourself now: Step 1: Read the number at the end of the long hand. Step 2: Say which side the long hand is on: 'minutes past' or 'minutes to'. Step 3: Read the number at the end of the short hand. Like this - '9 minutes to 2'. It's that simple! 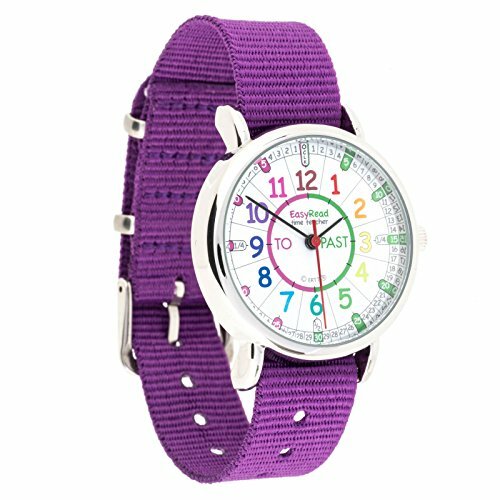 EasyRead Time Teacher children's watch, 1.3" diameter, with multi-colored face, purple fabric strap and metal buckle.